Flowers in spikes atop a single stem. Leaves narrow, multiply forked. Top cowl is more smoothly rounded than that of the hybrid, shown below. Note the monotonically curved upper cowl, quite unlike the re-flexed cowl of the hybrid below. 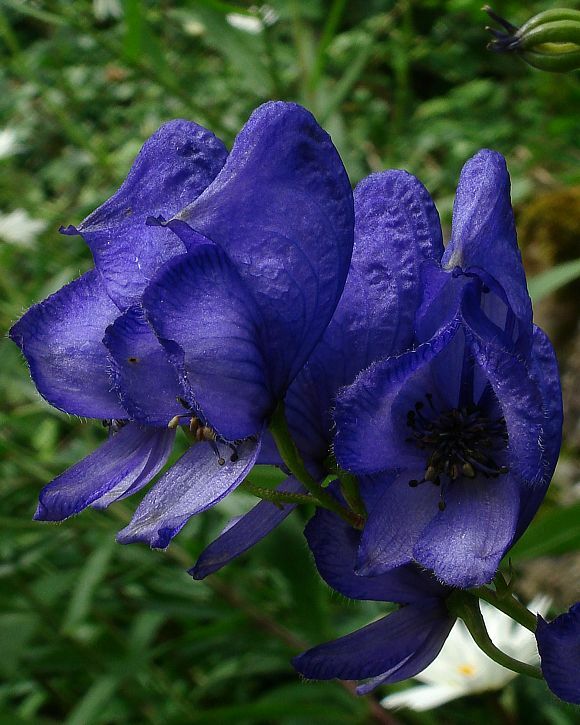 From the rear, four narrow darker-blue 'bracts' support and constrain the lower half of the flower. 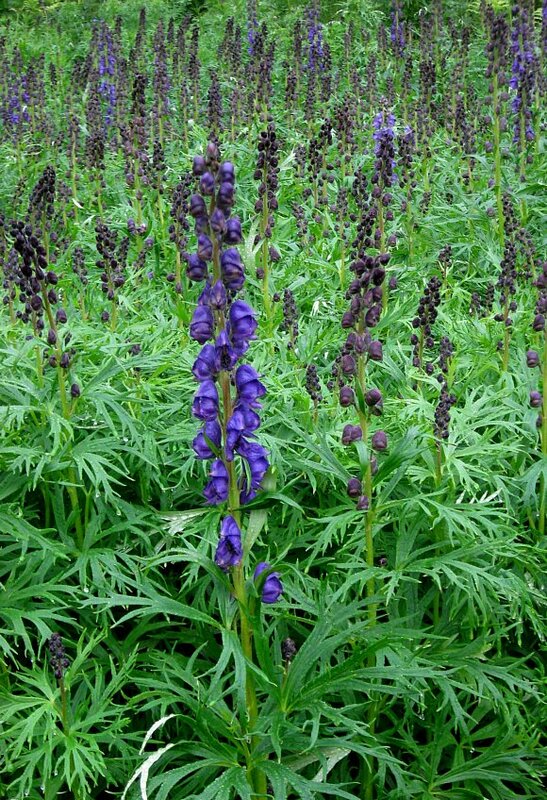 This is the hybrid between Monk's-hood and a European species ([Aconitum variegatum) which has no presence in the UK. The main difference being in the shape of the cowl, rounded in Monk's-hood, but a little pointy like a policeman's helmet in the hybrid. Flower has two prominent lower lips. 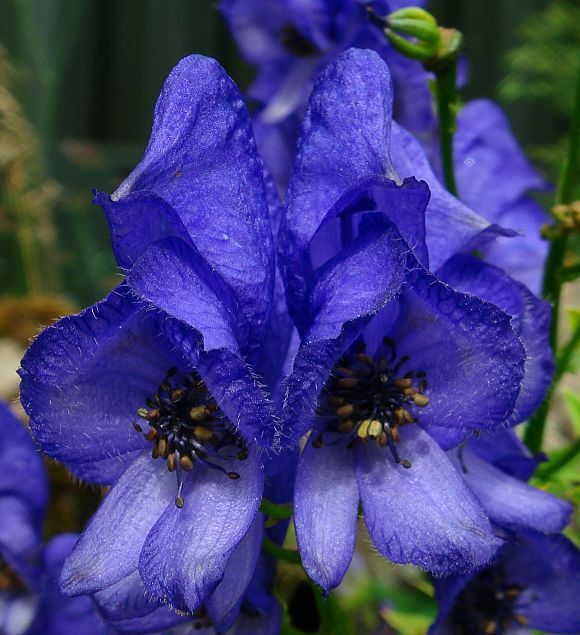 Deep blue flower. Black of brown seeds shrouded by peaked hood which itself is menacingly shrouded by a second over-topped hood. The whole assemblage suitably sinister. 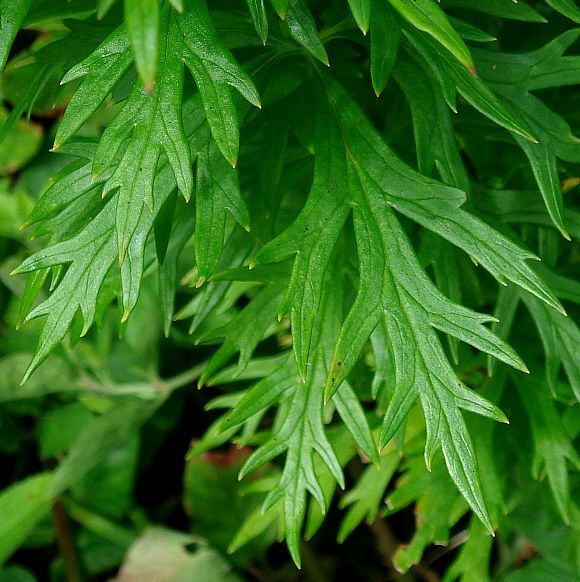 Veined leaves, multiply forked, pointed at extremities. These specimens on the Roman Road are probably throw-outs. They have a very pronounced pixie-hood typical of the garden variety. The top of the once-flowering flower spike now has fruits in place of the flowers, the petals having dropped off. Fruits held out sideways at a funny angle. 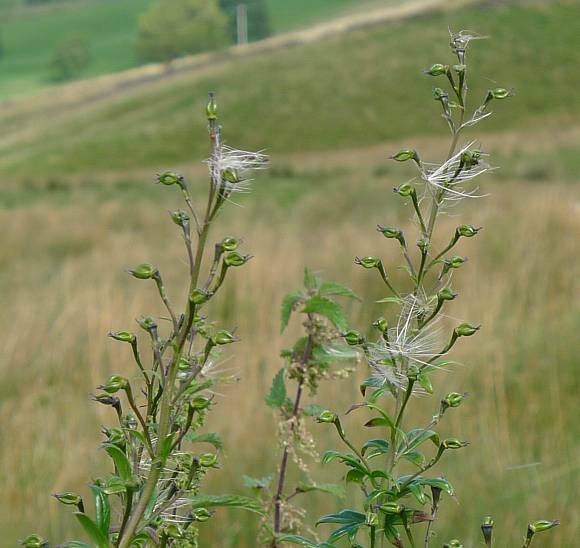 It has caught a few parachuted seeds blowing in the wind from some other plant, possibly from Rosebay Willowherb. 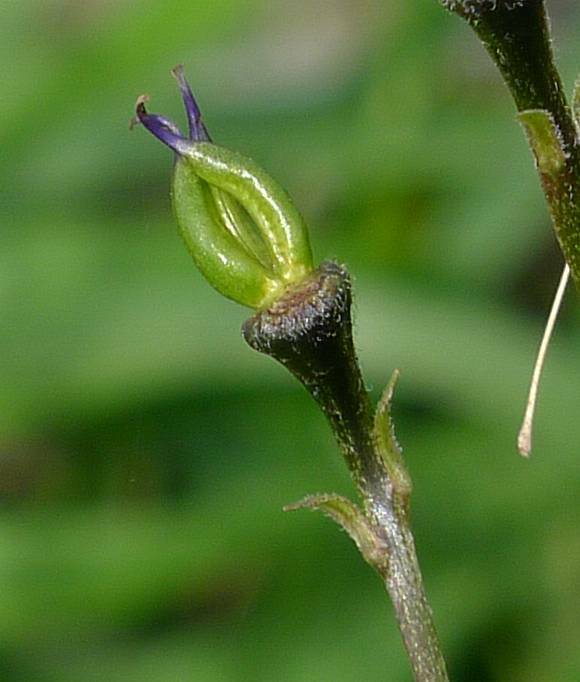 The fruits are singly on the ends of each flower-stem, which has a short narrow bract underneath. 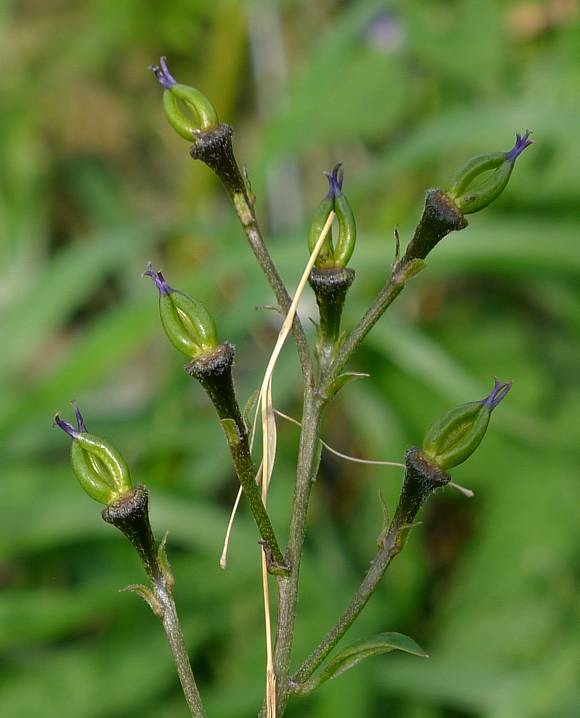 Atop a swollen dark-coloured hairy pedestal with two even shorter narrower green bracts below the fruits consist of three curved green tubular segments tapering to a re-curved purple tip reminiscent of circlip pliers. Easily confused with : the many different garden varieties that frequently escape onto nearby streams. In fact, your Author has had such a very hard time finding some that are not garden varieties, and even now he is not at all positive that all those photographs taken by myself are the true wild variety. If you know any of these are garden varieties, please write in to tell me. Distinguishing Feature : The helmet over the top of the lower part of the flower; smoothly curved in true Monk's-hood, but slightly pointy in the gardeners hybrid. It is a fairly rare [RR] except for the garden variety which does not count, nor your Author suspects does the hybrid bewteen the two. 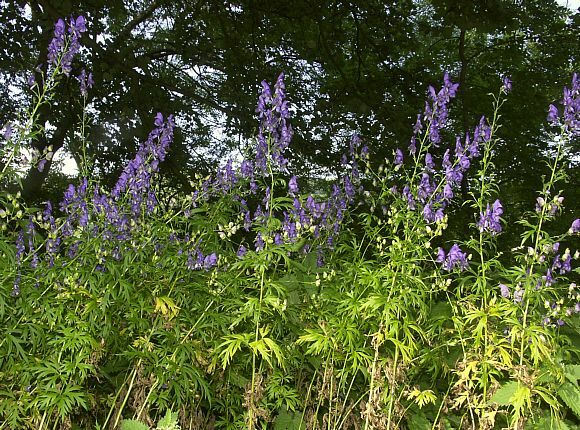 Monk's-hood is one of the most poisonous plants in the U.K. All parts of the plant are poisonous not only by ingestion but also by touch, and retain their toxicity even when de-composed. 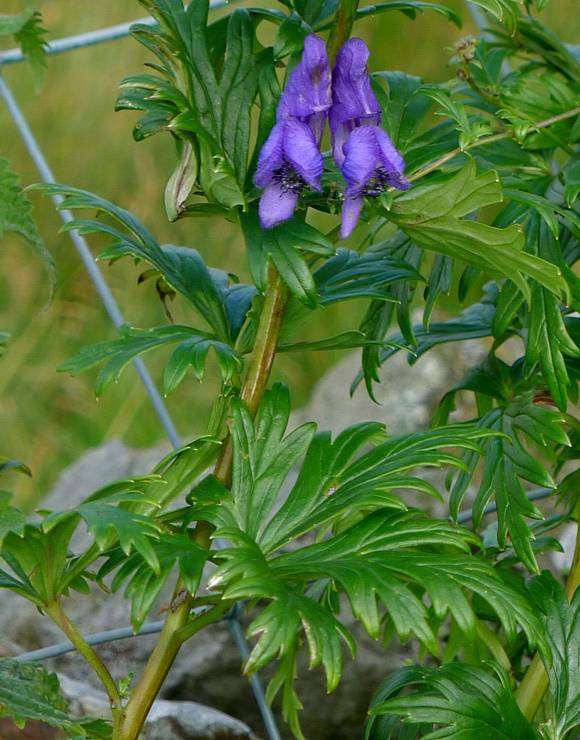 The plant contains aconitine, a neurotoxin, which is capable of being absorbed through the skin and can cause severe respiratory and cardiac problems in man and many animals that come into contact with it. There is no known antidote to monk's-hood poisoning, so it should be handled with extreme care, or not at all! Gardeners beware! It should not be planted where children are present. Aconitine is a neurotoxin, opening some sodium channels in the heart and other tissues. Symptoms of ingestion include paraesthesia, tingling in the mouth, tingling of extremities, then of the whole body, anaesthesia, sweating, cooling, nausea, vomiting, respiratory paralysis and cardiac arrest, quickly followed by death. The poison is so strong it was once used as an arrow-tip poison. 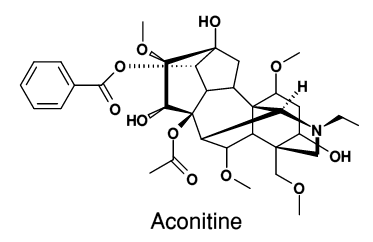 Aconitine has some (external only) uses in medicine. It is used to treat severe pain, neuralgia and sciatica. Its use internally is so un-predictable and the consequences so dire (there is no antidote) that it is of little use now, although it once used to be used as an anti-pyretic and analgesic. Its narrow therapeutic window has made it useless now. Aconitine is highly lipophilic, easily passing through the skin on contact. 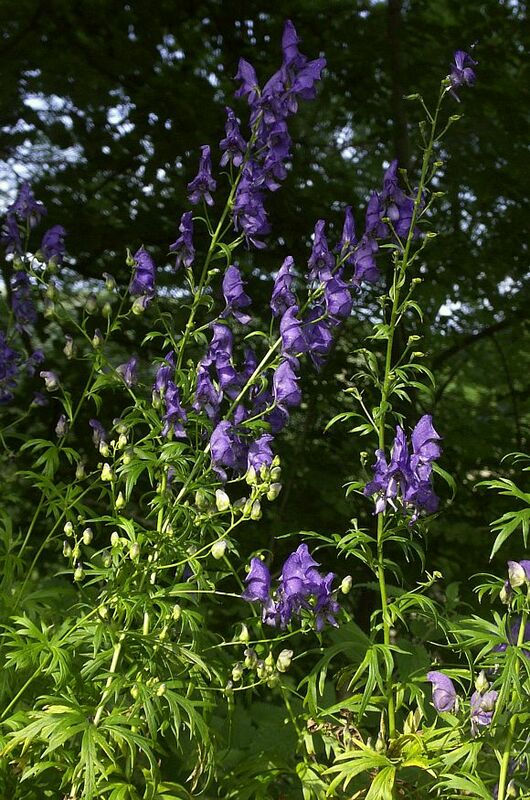 Monk's-hood also contains other poisonous diterpenoid alkaloids, Mesaconitine and Lycoctonine. 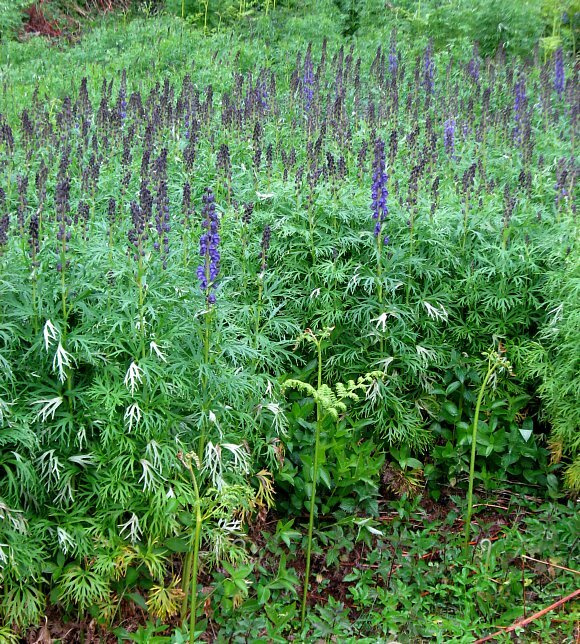 All parts of the plant are poisonous, especially the tubers where the alkaloids are most concentrated (up to 2%). 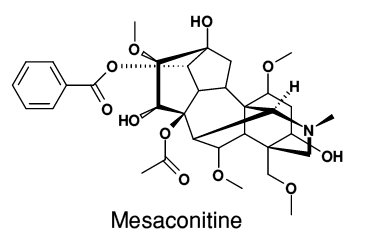 Mesaconitine is chemically identical to Aconitine apart from one extra carbon atom (on the nitrogen atom). 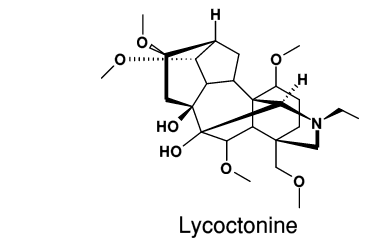 Lycoctonine is also similar to Aconitine but with the Benzoic Acid group (on the extreme left) absent. Also present are Hypaconitine , which structurally is almost identical to Mesaconitine, but with the ⋅OH group missing from the six-membered ring (far right). Neopelline and Neoline are two more aconitine type alkaloids present. 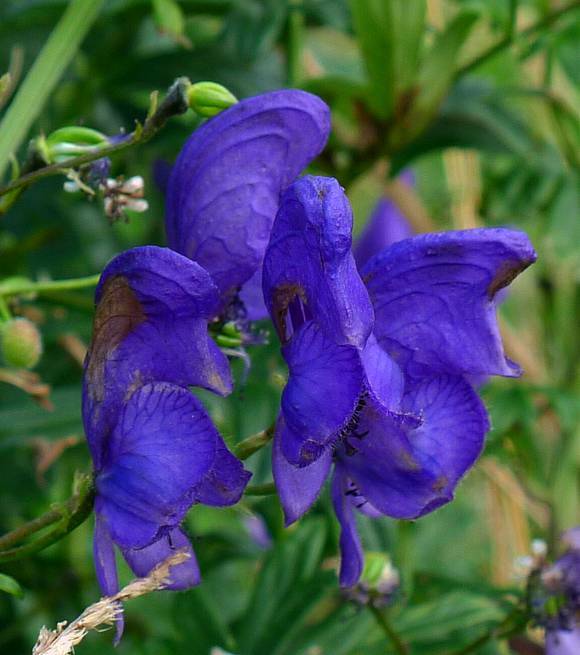 Dozens of differing Aconitine type alkaloids have been isolated from differing Aconitum and related species. 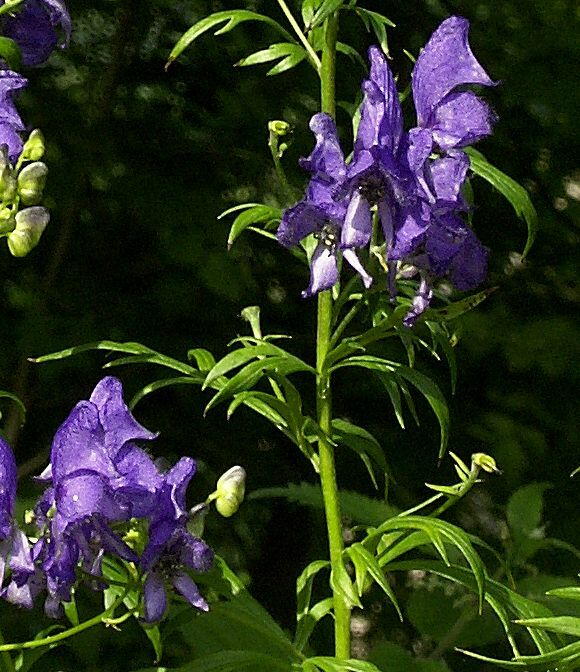 Some of the same poisons are present in other aconite species, which includes Wolf's-bane and Larkspur (Delphinium). 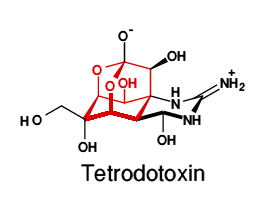 A totally different toxin, Tetrodotoxin (not present in Monk's-hood but produced by some poisonous fishes including pufferfish, blue-ringed octopus and some symbiotic protobacteria) bind to the same target site as does Aconitine, but rather bizarrely has the opposite effect. This means that Tetrodotoxin can sometimes be used as an antidote to Aconitine poisoning, but is itself so deadly toxic that the outcome may still be death. Lidocaine, an anti-dysrhythmic drug, blocks these same sodium channels and has once been used successfully as an antidote to aconitine poisoning. Tetrodotoxin, at an LD50 of 8µgm/kg body weight, is 100 times more toxic than Potassium Cyanide and 1000 times more toxic than Aconitine. Tetrodotoxin, a polycyclic compound, has an unusual adamantane structure (shown in red - being the diamond sub-unit skeleton), but one in which not all vertices are occupied by carbon atoms as they are in adamantane. Some other synthesized chemicals with the adamantane structure are used as pharmaceuticals and are much less toxic and have more predictable and controllable effects than does tetrodotoxin. 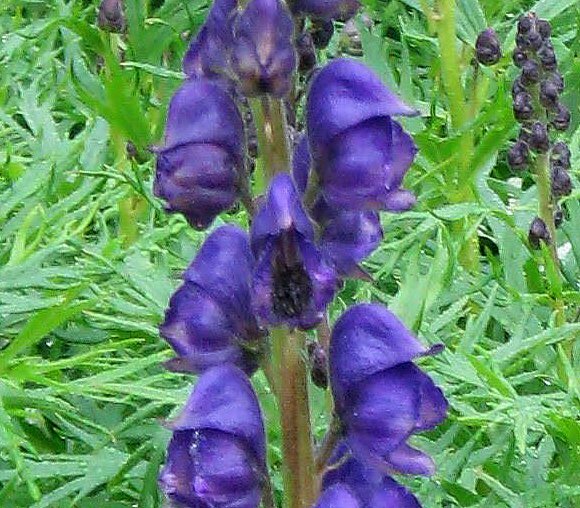 Another physiological antidote to Aconitine poisoning is to administer (at maximum strength) a combination of Atropine together with either Digitalis or Strophanthin , both of the latter being cardiac glycosides which act on the heart. Strophanthin is another arrow poison, this one obtained from the African plants Strophanthus gratus or from Acokanthera schimperi. There are two Strophanthins, k-Strophanthin and g-Strophanthin (aka Ouabain ).